The term “Art Deco” (which can be contentious) covers a wide variety of designs and approaches from the period, c1920 to c1940 and includes architecture, furniture, graphics, automobiles, and many other forms all of which were part of a modernist orientation. Stylistically it ranges from highly decorated buildings to streamlined shapes. 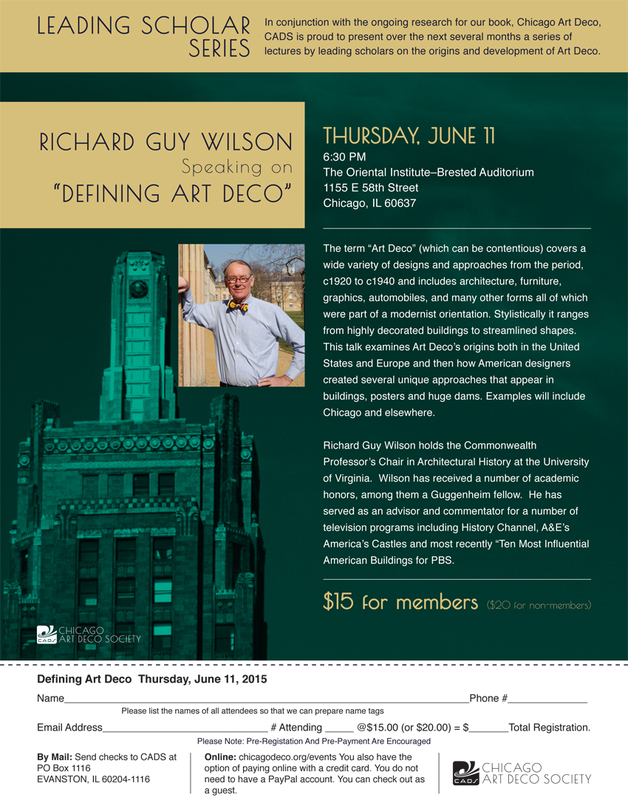 This talk examines Art Deco’s origins both in the United States and Europe and then how American designers created several unique approaches that appear in buildings, posters and huge dams. Examples will include Chicago and elsewhere. Richard Guy Wilson holds the Commonwealth Professor’s Chair in Architectural History at the University of Virginia. Wilson has received a number of academic honors, among them a Guggenheim fellow. He has served as an advisor and commentator for a number of television programs including History Channel, A&E’s America’s Castles and most recently “Ten Most Influential American Buildings for PBS.